I'm not sure if Maedhros's scars (on face and wrist) actually look like scars or just flaws in the painting. Since this is in Hithlum, Maedhros is diplomatically wearing fairly minimal silver jewellery, and a fairly plain shirt, and Fingon is rather more dressed up in gold and gems. 2: Lalwen with her hair coming down, leaning on her brother Fingolfin (who is amused) and laughing at Cirdan. I may try to paint this later. 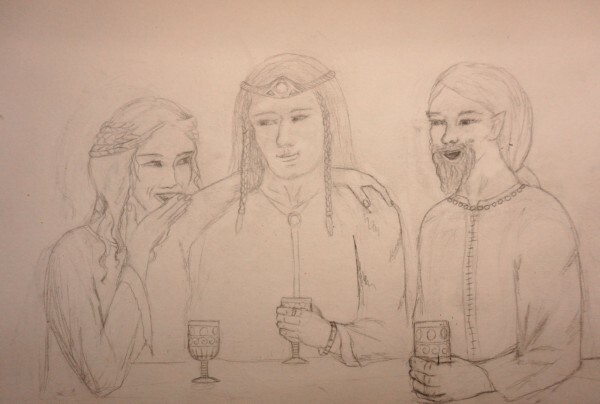 Next painting: Finrod, Maglor and Hador attempting to render House of Marach improvised songs into a language that all of them speak, without any great success. I like it that you're drawing those scenes! I think the scars do look like scars. Not actually sure about the visible scars idea, after a few hundred years... but I thought I'd see if I could paint them. I now realise that Fingon's shoulders are too narrow. Strange how you don't see these things till later. Oh well! 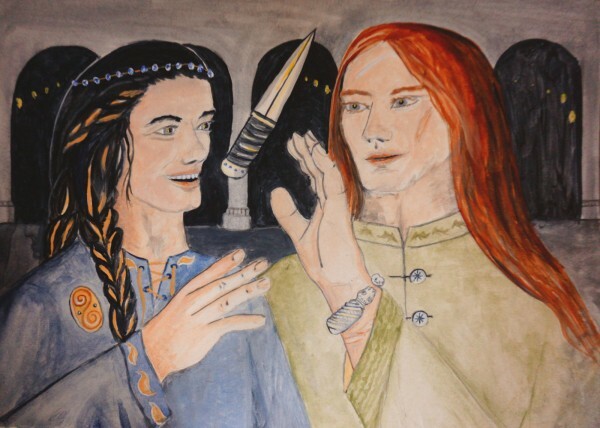 There is much ideological schism on the matter of Maedhros's scars in the community and several schools of thought! I actually quite like that picture at the moment, even with Fingon's weird smile, but from the fact that I Deviantarted it and it sank like a stone, I deduce that when I look at it, I am probably still seeing the picture in my head rather than the actual picture as it looks to other people on paper. I never know what will appeal to other people. Both the times I drew Himring, I was kind of discontented with it, but other people seemed to oddly love it, though it looked kind of stiff to me. And the role-playing painting I did really quickly (with a really anatomically odd giant spider) got people liking it far more than this one which has actual proper hands in it. I think it probably makes a difference whether you've read the story or not.